This site is the “home base” of the Visual Literacy Blog Project. I consider blogs to be a perfect marriage between the visual and the textual. Moreover, blogging fosters the expression of personal opinion and open discussion. It is an excellent exercise in thoughtfully sharing one’s ideas within a visual medium. I also see blogging as a tool that could aid my Visual Literacy students in formulating their own voices as interpreters of visual culture. Therefore, my students will be writing blog posts that discuss their experiences as creators and interpreters of visual culture. In doing so, they will also present their own critical insights into the various topics discussed during class. My hope is that the students also see their blogs as vehicles for creativity and self-expression. We are going to L.O.O.K. at L.H.O.O.Q. Marcel Duchamp (one of your Instructor’s/Blogmaster’s personal heroes) created objects and images that questioned our expectations, perceptions, and interpretations of art. He explored our abilities (and inabilities) to decipher images. 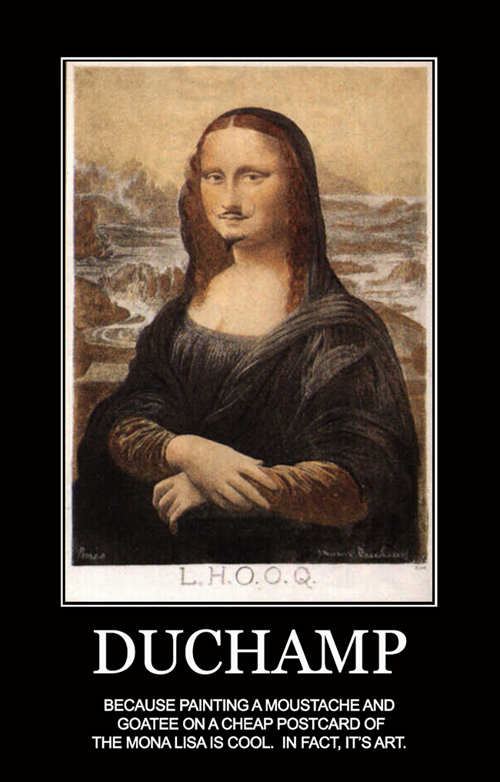 One could say that Duchamp made art that investigates what it means to be visually literate and illiterate (or just indifferent to art altogether). Therefore, our semester will begin with a close look at his work. Are you “readymade” for some “treacherous” images? 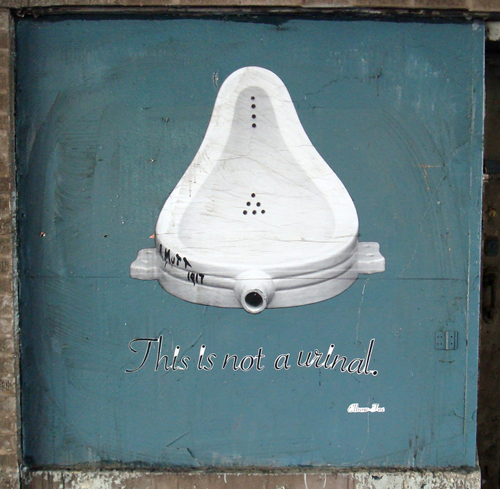 This art-historical “mash-up” of Magritte and Duchamp (by the street artist ELBOW-TOE) illustrates many of the themes and theories we will be discussing in class. O.K…O.K…I know what you are thinking: “I don’t get it?”—”That’s not art.”—”I don’t think this class is for me.” Well, in all honesty and with sincerity, I want you to know that you WILL get it. You may even eventually appreciate this piece as art. Visual Literacy is the right class for you!…Trust me. You belong here.